As applied to community associations, the new law has some important limitations. For example, it only protects an owner’s ability to use a clothesline in a backyard designated for exclusive use. So, the law does not sanction an owner’s ability to use clotheslines in other areas, such as their front yard or a shared rear yard. Further, the law explicitly states a balcony, railing, awning, or other part of a structure or building does not qualify as a clothesline. So, the new law does not protect owners who string wet clothes over their balcony railing to dry. Even where a backyard clothesline is concerned, an association may establish reasonable restrictions on the use of clotheslines and drying racks. A restriction is reasonable if does not significantly increase the cost of using a clothesline or drying rack. 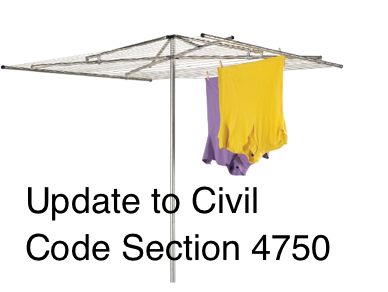 As the cost of a clothesline or drying rack is generally low, and the law does not provide any guidance on what constitutes a “significant increase” in cost, this may become an issue. As it stands, associations should take note that any prohibition or unreasonable restriction concerning the use of a clothesline or drying rack in an owner’s backyard (exclusive use or their property) is no longer enforceable.